WWMSD? (What would Mark Spitz do?) 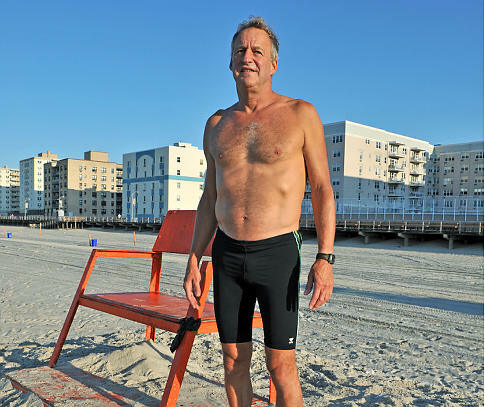 According to the headlines, a 61-year old Long Island lifeguard named Roy Lester claimed that he was fired from his job because he “refused to wear a Speedo”. He is quoted as saying, “I wore a Speedo when I was in my 20’s. But come on. There should be a law prohibiting anyone over the age of 50 from wearing a Speedo.” Hey, wait a minute… I have issues with that! In fact, I am publicly declaring that for my big “Five Oh!”, I want everyone to give me a Speedo as a gift. But anyway, here’s the story: Lester is claiming age discrimination, believing that the “Speedos rule” is a mechanism used to filter out the older lifeguards. Does he have a case, or is this GILF all wet? No man, regardless of age or body type, should be forced to squeeze his family jewels into a scrote tote… uh, I mean “Speedo”, against his will. A square cut Greek-style bathing suit or snug pair of mid-thigh trunks would do the job of lifesaving just as well. At first, Lester’s gripe seems legit… but calling it “age discrimination“ just seems a bit too out there as a defense. And, this case of man versus marble bag… uh, I mean “Speedo“, is more complicated than it seems. Lester actually filed this suit in 2007. He states that back then, he was forced out of the Jones Beach lifeguard job he had held for 40 years when he refused to wear a ding-a-ling sling for the annual swim test. Lester sued, claiming age discrimination. The suit was dismissed on technical grounds in 2008, as was yet another suit Lester filed in 2009. Last week, an appeals court reinstated his claim. Lester’s case could go to trial this year in his native Long Island. (I can’t wait to watch that case on TV. Lawyers, submit your briefs!) Currently, the established protocols of the lifeguard tests state that male candidates must wear “boxer, briefs or board shorts” during a 100-yard swim– which they must finish in 75 seconds. Apparently, Lester prefers to wear biker shorts, which are not allowed. There is currently no policy specifically requiring lifeguards to wear banana hammocks… uh, I mean “Speedos”, during their annual tests. Whether or not there USED to be such a requirement in 2007 or 2008 may determine which way the verdict will, ahem… hang.